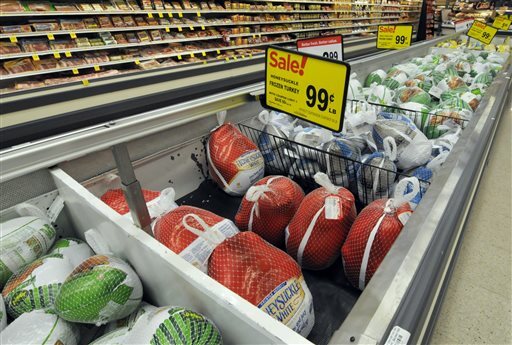 ST. GEORGE — Food-borne illnesses increase during the holidays, primarily because of the number of turkeys prepared this time of year. If not prepared properly, turkey and all poultry can carry salmonella, a common type of bacteria that can cause illness. Consider these tips for preparing a safe and tasty turkey this year. The first and most important food safety step is to properly thaw the turkey. The best way to thaw it is in the refrigerator. Make sure it is still in its original wrapper, and put a tray underneath it to catch juices and prevent cross contamination. You will need 24 hours of thawing time for every 4-5 pounds of turkey, so make sure you have enough time to properly thaw it. Once thawed, cook the turkey within one to two days. Use a cold water method to thaw the turkey more quickly by placing the turkey in an airtight package or leak-proof bag. Submerge the turkey in cold water for 30 minutes per pound. Make sure to change the water every half hour so it remains cold, and then cook immediately. Smaller turkeys may be thawed in the microwave, but check the manufacturer’s instructions to make sure it will fit in the microwave, the minutes per pound and the power level for thawing. Roast it immediately after being microwaved. It is never safe to thaw turkey or other meat on the counter, as it puts the meat in what food safety experts call the danger zone, 40-140 degrees Fahrenheit, which is where bacteria multiply rapidly. Under ideal conditions, bacteria can double every 10-20 minutes, which means that one cell can increase to more than 16 million cells in 8 hours. For this reason, perishable foods such as poultry should never be held at room temperature for more than 2 hours. To roast a turkey, set the oven temperature no lower than 325 degrees. It is not safe to cook a turkey for a lengthy time, such as overnight at a very low temperature, which encourages bacterial growth. Use a meat thermometer inserted into the thigh to check if the meat is cooked completely, and do no rely on the pop-up thermometer alone. Meat thermometers are available at reasonable prices in most supermarkets and variety stores. To be safe, the thigh meat should reach 165 degrees Fahrenheit. If the bird is stuffed, the stuffing should reach 165 degrees as well. Promptly refrigerate leftovers in shallow containers. While some families leave turkey and other perishable items out all day for people to nibble on, it is unsafe. Place perishable items in the refrigerator, and if people want to snack, they can get the food out of the refrigerator. For more information on turkey preparation or storage, contact the local University State University Extension office or contact the United States Department of Agriculture’s Meat and Poultry Hotline at 888-674-6854.